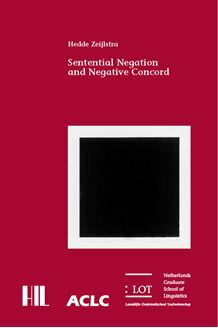 Sentential Negation and Negative Concord describes and explains a series of phenomena that surface in the study of negation as well the typological correlations between these phenomena. (iv) the interpretation of constructions in which a universal quantifier subject precedes a negative marker: in most languages the negation then outscopes the subject. Based on the results of Dutch diachronic, Dutch dialectological and cross­linguistic research the author shows that all these phenomena can be described in terms of typological implications. For instance, every language that bans true negative imperatives has at least a negative marker that is a syntactic head; and every language with such a negative head marker is on its turn a Negative Concord language. The author presents a syntax-semantics interface theory of sentential negation and Negative Concord that correctly predicts these typological implications. One of the general conclusions of this study is that n-words (in Negative Concord languages) should not be thought of as negative quantifiers or negative polarity items, but that they should be considered as semantically non-negative indefinites that are syntactically marked for negation. This study is of relevance to syntacticians, semanticists and scholars in the syntax-semantics interface, as well as to diachronic linguists, dialectologists and typologists.